The first step to removing a stain is determining whether it's truly a stain, or instead the etching of the surface from a strong food acid, such as lemon juice. 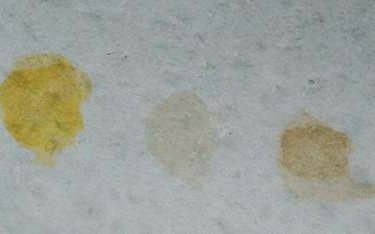 Stains are usually discoloration, such as from coffee, mustard, or red wine, and are treated very differently from etching (see Fixing Spots Caused by Acid Etching). Mustard, coffee, and red wine stains (left to right). Oil (dark spots) and acid etching (lighter areas). Stain removal is something most homeowners can do themselves with the right materials and methods. For stains like grape juice and mustard, household bleach applied to a cotton ball or a folded paper towel is often adequate to remove the discoloration. Soak the cotton ball or paper towel with bleach, place it on the stain, and set a heavy glass or cup on top. Usually the stain is gone in 5 to 10 minutes. Generally most countertop finishes are not affected by short-term exposure to bleach, but it's best to verify this in advance before leaving bleach on your countertop for a prolonged period of time. 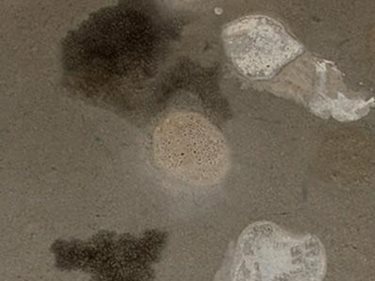 Oil stains darken the concrete where the oil has soaked into the surface and may require more aggressive removal methods, such as the use of a poultice (see How to Remove Oil Stains). A poultice is a mixture of an absorbent powder and a liquid solvent. The solvent soaks into the concrete and breaks up the stain, while the powder draws the stain out of the concrete. The natural stone industry has been using poultices for a long time, and many commercial poultices are available. However, you can also make an effective poultice using simple materials available at grocery and hardware stores.